I used a variety of liquid bait, but what has worked best is Mountain Dew (jacked up with added sugar) and apple juice/vinegar. The trap in the photo above is a jar with a small hole in the lid. I smeared the underside of the lid with jam. It has been very effective. I also used empty plastic bottles with the top cut off and inverted. These work, but not as well. Also effective is the bees themselves. Since I had to take the entrance reducer out (see Formic acid discussion below), the wasps were really crowding the door. The bees were being aggressive and defending the hive by knocking the wasps away. To help them a bit, I stuffed some grass in the opening. Seemed like a reasonable compromise. 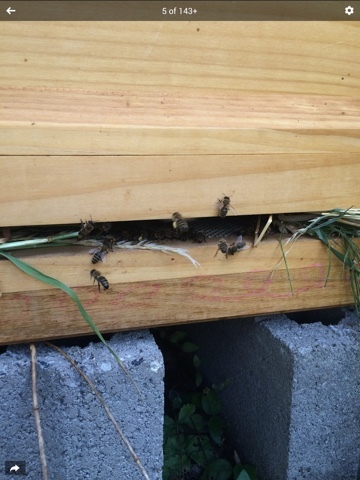 The bit of pink on the bottom of the hive in the picture above is sidewalk chalk. It is supposed to keep ants out, and seems to work. I just drew loopy doodles around the lowest brood box. I have had a visitor to the hives as evidenced by the picture below. 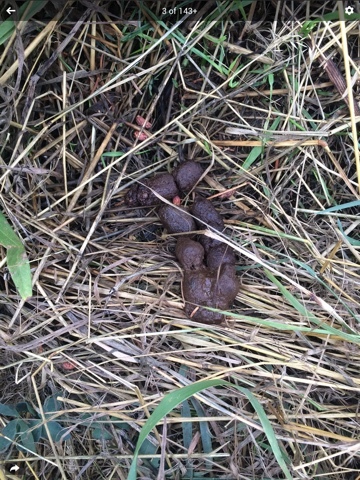 I have found two such … piles. Fox, perhaps? I don't know. Yesterday I broke down and installed Formic acid dispensers in each hive (to treat varroa). In case you are interested, I'm using 85%. I was worried about how the bees would react to the acid. I didn't have any problem handling it-- although I wore dishwashing gloves and my glasses and brought a bucket of water with me -- but the smell is apparently quite strong, and the bees don't like it. Now I'm worried that it won't be strong enough to do the job, but everything I've read says "READ AND FOLLOW THE INSTRUCTIONS!" So no going off piste here. That said, it looks like business as usual for the bees. No piles of sad bee corpses anyhow. At least not yet. I was told to open the hive door, but to install the tray that goes under the hive (which blocks much of the ventilation that comes from underneath). I was afraid this would be a problem, but seems okay. I'm reading more and more online about the benefits of not using foundation, particularly in terms of varroa treatment. Left to their own devices, the bees make smaller cells, and the mites prefer larger cells. As I replace frames, I'm going foundationless (with a Toblerone-shaped strip of wood trim at the top of the frame as a starter). Lots and lots of pollen going into the hive the past few days (well, perhaps longer, but I've been paying attention this week). I don't know exactly what it is, although pollen.lu says that chestnut and nettle is heavy this week. Not sure what color nettle pollen is. The picture above doesn't really show it, but there were as many as four or five bees with full pollen trousers in the hive entrance. I have done some varroa counts over the summer and find my numbers seem to be off the chart. 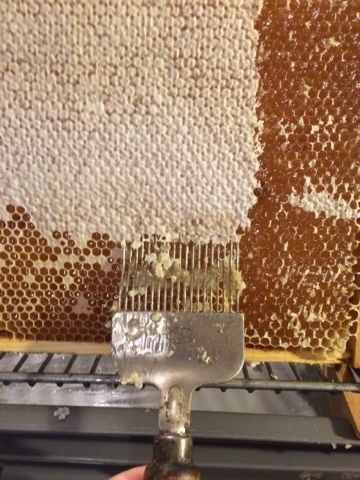 I treated the hives twice with powdered sugar (once I remembered to put the trays in so I could count what came off the bees -- it was impressive), but this method only removes varroa mites that are ON the bees and not any inside the brood cells. I will have to treat with something stronger. Stand by for further details. In the meantime, I was at the hive yesterday and noticed a LOT of yellow jacket activity. A quick google showed that this, too, is a problem and the wasps will raid hives eating larva and honey. I have read accounts of people discovering an entire hive wiped out in short order. I swear this beekeeping thing is more stressful than parenthood. So much can go wrong! One immediate suggestion was to reduce the size of the hive entrance so it will be easier for the bees to police themselves. My hives (all purchased hives) come with a removeable entrance reducer. I had a bit of trouble as mine seem to have swollen or otherwise reshaped themselves, but I managed to install them and I think they are doing the job. In the meantime, I have had a few discussions with several of the more experienced beekeepers I know about matters ranging from honey extraction to varroa treatment to preparation for winter. The adage remains consistent: Ask 10 beekeepers and you will get 11 opinions! H and A are old school: they believe in managing the hives. M is more New Age: he manages his hives minimally, believing the bees know best. I wander all over the map, but more and more I tend to believe that, as in childbirth, Nature knows best. That many of our beekeeping problems have arisen because we get in there and try to control things. That many times beekeepers do something because that is the way it has always been done. That said, as in childbirth, I have only a few months experience. It feels uncomfortable to challenge a beekeeper with decades of experience. My husband point out that the good news here is that H, A, and M all seem to have successful hives. If they are operating at opposite ends of the spectrum, perhaps there is no right or wrong way to do things. Time will tell, I suppose. Tomorrow A is coming to look at my hives and give me some advice. Saturday is a practical session at M's hives. While I already know I am going to follow M's suggestions (I had a chat with him last week), I still want to hear what A has to say. I want to hear what all beekeepers have to say. Sting Update: Got stung on my nose during my last powdered sugar treatment. I had my snout RIGHT in the frames, and a bee got me right on the side of my nose. My daughter reports that not only did I NOT drop the box of bees/frames I was holding, I didn't even swear. Further, I had no evidence of the sting by the time I got home. Oh, it HURT a LOT at the time. Made my eyes water. But very quickly I was fine. Faithful Reader Anita asked me to explain varroa. Sigh. That's a huge topic, and one that is fraught with opinions and lots of things I don't completely understand. The short answer is that there are two creatures living in my hives: honey bees (Apis mellifera) and varroa mites (Varroa destructor). Varroa is a mite that came from Asia. There, the mite causes little damage as the Asian bees are more tolerant. Since the 1980s, however, varroa has spread around the world. Our Western honey bees are much more susceptible to the varroa, which is credited as being one of the many things contributing to colony collapse disorder. What happens is that the mites lay their eggs in the bees' egg cells. They are particularly fond of drone larva as those cells are bigger and the gestation period is longer and more to their liking. Mite infestation weakens and maims the bees, causing them to be vulnerable to other parasites and diseases. Google for images of varroa and varroa damage. It's grim. I do have varroa in my hives. Everyone does. When I did a basic count recently I was pleased to not see much. From time to time I see varroa on a bee. That makes me sad. One of my more experienced beekeeper mentors told me that this year has been good for bees in that the varroa doesn't seem to be as evident as in past years. Last year was apparently really bad. I don't know how much weather contributes to varroa levels in bee hives. There are wildly disparate schools of thought on treating for mites from doing nothing (the idea being to encourage the bees to, via natural selection, breed themselves stronger as the mites only become resistant to treatment) to a variety of commercially available treatments. Somewhere in the middle are methods that include encouraging and then culling drone brood or splitting hives (artificial swarms) to disrupt the mite life cycle or sprinkling powdered sugar on the frames (the bees clean themselves, removing the mites, the mites have difficulty maintaining purchase and fall off). I know beekeepers on both ends of the spectrum. I ask lots of questions, read as much as I can, but mostly I worry. I worry a lot about my bees anyhow. Are they okay? Am I doing what is best for them? Am I too intrusive? Am I not reacting quickly enough? It's very stressful, and I lie awake at night often, fretting about my responsibility to all these creatures living under my watch. This is a very short and vague answer, but I hope it helps. There she is: a queen! All sleek and regal. We are calling her Isabel. I had run over to the hives last Tuesday (June 16) to pop in the white plastic boards that fit in the base of the hives. I was curious about varroa. 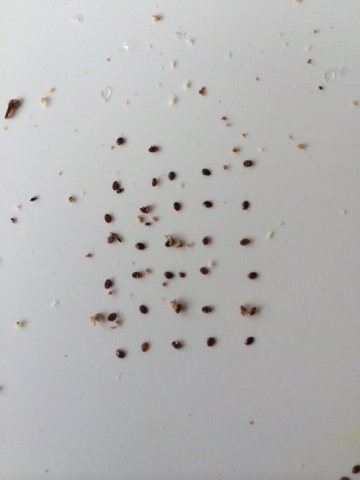 You leave the white board in place for 2-3 days, and then you count the varroa that fall. This gives you some indication of your level of infestation. Anyhow, I couldn't resist opening the Little Hive on Tuesday to see why everyone was so zen in there. And there she was: a queen. I wasn't convinced I knew what I was looking at at first. And she is spritely, moving around the frame very quickly. But I managed to take a picture which I then sent to my husband. He called me immediately and said, "Hey, look at that! We have a queen!" So I felt validated. I ran over to the Bee Store to get a queen marking kit, but then we had several days where it was too rainy and too cold to open the hive. (I don't want to open it if the temperature is below 16C, which, even in June happens here -- I even had the heat on last week.) In the end I didn't get back to the hive until yesterday (June 23). I took my oldest daughter with me to man the smoker, and together we looked at every frame (and there are only ten) twice. But no luck. The mood in the hive was still zen. Foragers were bringing in pollen. And we could see eggs and larvae. We knew she was there. But we could not find her. Today I couldn't stand it, and we went back again. We looked at every frame without any luck and were working our way back through the frames when we finally spotted her. Again, she was moving very quickly, and what followed was a series of amateur moves while we managed to catch her, glue a blue dot to her, and return her to her people. Now I'm convinced we manhandled her, and while I want to give them a break from my intrusiveness, I'm dying to spy on her now that she will be easier to see. Maybe Sunday. See the reddish-brown dots? We also saw a lot of grey pollen on bees, which, according to my sources, is probably poppy or berries (blackberries and raspberries). We also added some bee candy (sugar paste) to the Little Hive. The idea here is that you want the hive to reach a critical mass (10,000 bees) before winter. By feeding them, the foragers don't have to work so hard, and the queen has the energy for all the egg laying she needs to do to get the hive strong enough to winter over. Tonight I went to see an organic beekeeper. He has a small hive in a glass frame. You can see the bees working and doing their bee dances. And you could see their queen. She would look around for an empty cell, and then lay an egg in it. It was so cool to watch. Another thing to look for at my hives. After I brought home my giant bucket of honey on Tuesday, I decanted it into about 36 500 gm jars. I did not whip it, as is the custom here in Luxembourg. Yes, I will undoubtedly have crystallization. But I like runny honey. 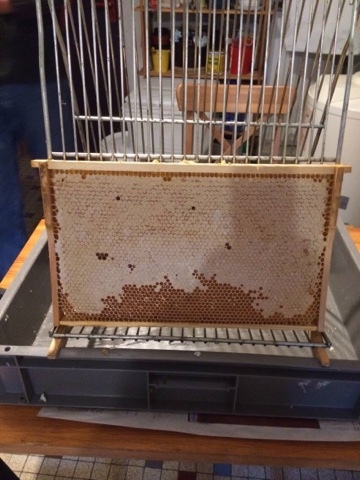 After completing the extraction, I had ten frames that had previously held honey. We took these back to the hive on Thursday (this was when the DH got stung on his hand). 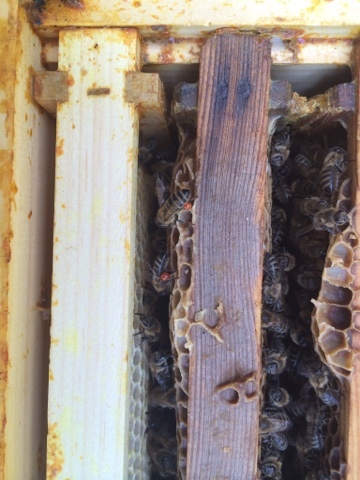 We put two of the frames into the brood box of the Big Hive. To make room for these, we took out two frames from the Big Hive brood box that had uncapped brood/larvae. We brushed off most of the worker bees, and put these two frames in the Little Hive (which only had about five frames in it anyhow). In retrospect, we figured any Big Hive bees left on those frames would eventually exit the Little Hive, be a bit befuddled, and then just go home to the Big Hive. We added five other honey-extracted frames to the Little Hive. It is now just one brood box with ten frames in it. We have not yet seen anything resembling a queen in it, and those bees were fractious and angry. 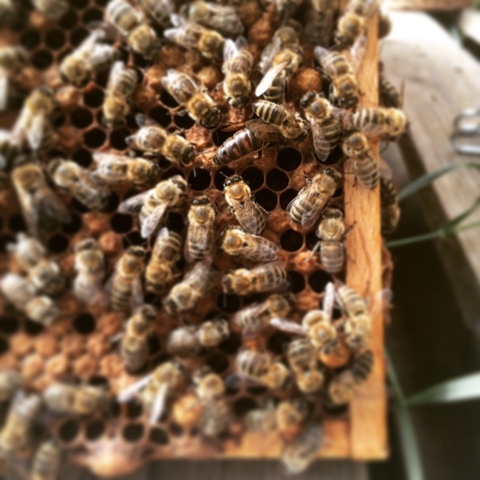 Hopefully those workers will turn one of those new eggs we added into a queen. 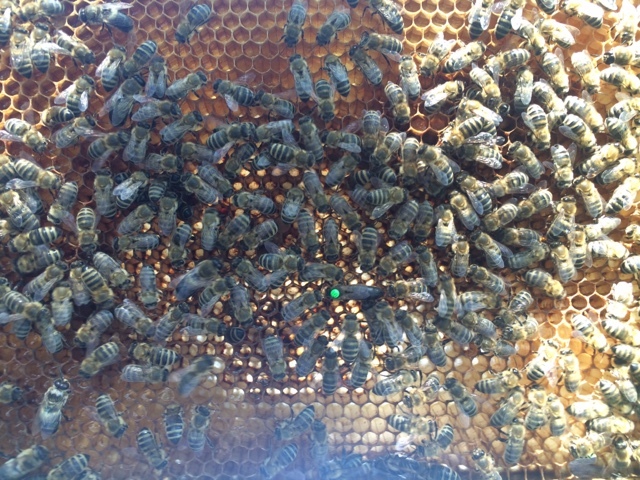 Below, you can see Charlotte, Queen of the Big Hive (green spot). I was fortunate to have a bee friend offer me use of his extractors this week. To prepare for this, Sunday night we went to the Big Hive and put in what's called an escape board. This is a wooden contraption that has a one-way door: the bees can leave the honey super, but they can't get in it. You place it below the honey super you want to clear of bees and usually within a day or so (one of my books says 48 hours) the bees will move down into the rest of the hive. Apparently the bees in and around the honey stores are foragers, so they want to get back to work in the fields. This morning we went over and took off the honey super and the escape board. The method worked well, and there were very few bees in the super. We gently brushed people off into the hive. Then we moved the super to the car. It was very heavy. 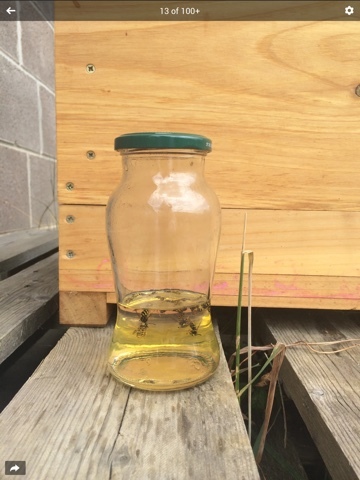 This is why some beekeepers prefer half-size honey supers. Later we learned that the super (with the frames and honeycomb) weighed about 23 kg (about 50 lbs). I took it to my friend's house. He has two extractors. The one in the back of the photo below is electric, but, sadly, my frames don't fit in it (too small). So we used the hand-crank one in the foreground. It could hold two frames at a time. But first we had to cut the caps on the wax cells. I did this with a special fork. After you uncap both sides of the frame, you can put the frame in the extractor and give it a spin. Uncapped frames look like this. Here you can see me uncapping the wax with the fork. The honey comes out a valve in the bottom of the extractor and into a special bucket with a valve. I have a plastic one, but it leaks a little. I can see that it might be a good idea to use a stainless steel container (#ChristmasWishList). When I got the honey home, I weighed it. I forgot to weigh the empty bucket, but together they are a little over 19 kg (just under 42 lbs). Later this week I will dispense the honey into jars. 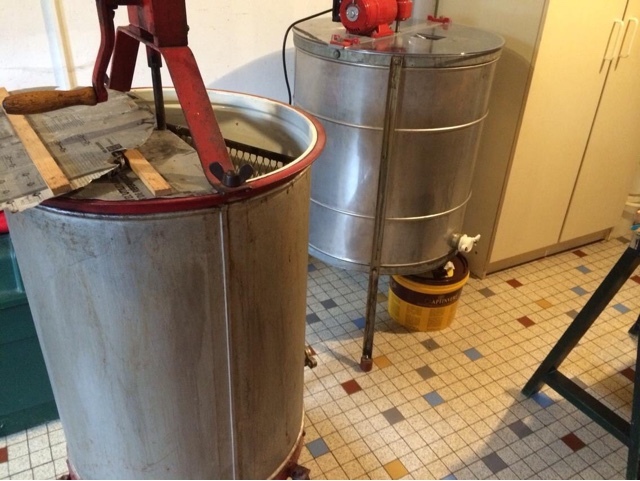 Many beekeepers in Luxembourg like to whip their honey to prevent it from crystallizing. But this creates spreadable and not runny honey. I may take my chances, although this honey has a rather low water content (about 15%), which, as I understand it, is good, but might lend itself to crystallizing sooner. So far I have only been stung once in 2015, and not by my bees. I was handling some drone brood cells we had culled from a hive at a practical session, and I got stung on my finger. I don't wear gloves as they interfere with my ability to handle the frames. I own a hat/veil, but find it hard to see through it, so I rarely wear it. Even when the bees are especially fractious, I find they aren't going for my face. I do wear closed shoes and long trousers (walking from the car to my hive means walking through Nettle & Tick Land) and a white jacket (because it has pockets for my glasses, phone/camera, and a pen). Update: As of Thursday, June 4, my husband was stung on the hand at the hive. He said the bee came right at him in a defensive attack. We had just taken away one of the honey supers two days before, so they were rightly suspicious. Update: Monday, July 13, got stung on my nose during my last powdered sugar treatment . I had my snout RIGHT in the frames, and a bee got me right on the side of my nose. My daughter reports that not only did I NOT drop the box of bees/frames I was holding, I didn't even swear. Further, I had no evidence of the sting by the time I got home. Oh, it HURT a LOT at the time. Made my eyes water. But very quickly I was fine.